Bob Moore service is always about my expectations and Reggie was exceptional as well. Craig was excellent he helped find us exactly what we wanted. Third car we bought from him .Tommy in service is excellent .Larry was excellent with paperwork / finance. Only place to buy a car from!! Great service highly recommend taking your vehicle there. Reggie gives great customer service. The service department is great! Reggie has been spot on and keeps things running smoothly. My INFINITI Q50 was totaled in a car accident and I had been researching different vehicles, dealerships, etc. prior to making my new purchase. We decided to go with another INFINITI vehicle, since I loved my Q50 and how it performed throughout the years of ownership. 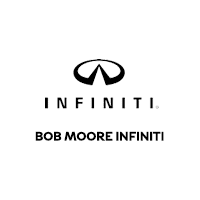 I contacted Bob Moore INFINITI to set up an appointment and to let them know what I was looking for and my expectations as far as vehicle options/pricing. The reason I did this ahead of time was because I didn't want to waste any time with any "sales talk". Jeff Collins, New Car Director, answered my call, took notes and set up an appointment. Blane Hopkins was assigned as our Sales Associate. Blane was very helpful and kind throughout the entire process. Between him and Jeff we were able to obtain exactly what we were looking for; no wasted time. I absolutely hate shopping for cars because Dealerships usually spend an enormous amount of time offering you deals you have clearly expressed no interest on. Everyone we came in contact with was very pleasant and professional. 'Bob Moore INFINITI' understood our expectations from beginning to end delivering what we wanted, and respecting our time. Always have a good experience, and they were on time with my service. INFINITI always gives great service. It seemed for a while they had lost the personal touch they had in recent past, but Tommy Freeman answered all my questions. I have Bob Moore INFINITI do all my service, and would not trust anywhere else like I do them. Thank you, Tommy! Great service dept. Took no time at all to drop off my car and pick up a loaner. Holly was very helpful, friendly and professional. My service issue was completely taken care of. And with a wash and tire dressing.